A general view of Old Trafford. MANCHESTER UNITED FEAR they could be left temporarily ‘homeless’ if they try to enlarge Old Trafford. Although United’s ground already has the largest capacity of any purely league football venue in England at 74,994, there have been calls for it to be increased such is the demand to see the Red Devils. 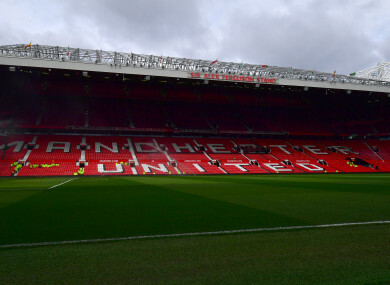 The Manchester United Supporters’ Trust has urged club officials to make the stadium ”the largest in Europe”, saying fans “deserve no less”, amid reports the capacity at Old Trafford could be increased to 88,000. But unlike London side Tottenham Hotspur, who have played their home games at Wembley this season while they build a successor ground to White Hart Lane, the only venue of comparable size near Old Trafford is local rivals Manchester City’s 61,000 Etihad Stadium. United are unlikely to be able to continue to play at Old Trafford during building work, but the thought of moving home games to the Etihad won’t go down well with their supporters. The only area of Old Trafford where expansion is a realistic possibility is the Sir Bobby Charlton Stand and Manchester United managing director Richard Arnold told the United We Stand fanzine: “We haven’t left the easiest stand until last. It’s sandwiched in a fairly narrow strip of land between the pitch and the main Manchester to Liverpool railway. He added: “It would be a multi-season challenge and it isn’t certain that there’s a way of doing it which doesn’t render us homeless. We have the biggest fanbase in the country and we’re not in London, where we could use Wembley. Email “Man United uncertain over Old Trafford expansion amid 'homeless' concerns”. Feedback on “Man United uncertain over Old Trafford expansion amid 'homeless' concerns”.